I have been trying so hard to read books to my grandbabies, especially the 2 year old, and she only wants to tear out the pages. So, yes I refer back to mother goose songs on YouTube because she knows every word. I will take your advice to try and change my voice and purchase Dr. Suess, thanks for the suggestions! For those very young ones like your 2 year old grandchild, better buy the sturdy books which are made of cardboard, not paper, so they cannot tear them. Or flashcards would be suitable for them as well. You tube nursery rhymes are of course more entertaining with the moving characters and songs , but if you learn to act out the characters in the book that you will be reading to them, they will be entertained as well. Make them join you in acting out as well. Reading benefits all children. It is such a easy way to spend time with them As a grandmother who has kids in different places, I love to Skype twice a month for a 10 min. Reading. We each have a copy of the same one (with the older kids) and take turns reading. Time goes by fast and we all enjoy the visits. I love that you still read to your grandchildren even if they are faraway through Skype. Truly your connection with them becomes meaningful with this activity. I’m sure they always look forward for this special bonding with their grandma. 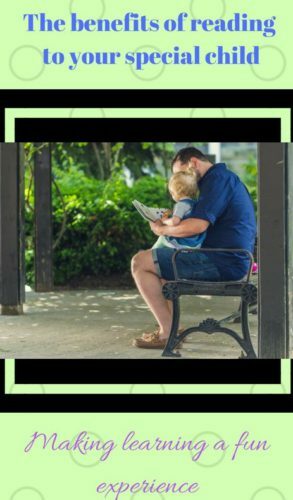 Thank you kindly for creating and sharing this article regarding the benefits of reading to our children with us all, it is appreciated. I do feel that this article and the benefits are in regards to all children, special or not. Reading gives our children more exposure to language, and with our mixed race child myself and my partner alternate days and languages that we read to her in, we have been doing this since birth! and she is now completely fluent is both English and Vietnamese, and now adding in my second language. Hopefully she will become completely trilingual. Never forget kids are like sponges, they absorb everything and have unlimited potential! You are right, reading is beneficial to all kids, including children with special needs. Your daughter is very lucky to have parents who know that reading will help their kids to fully develop mentally. I salute you for letting your daughter learn both your languages with her mom and another one soon? Wow! How old is she now? Kids do learn easily especially if started early on. I can only agree with you. Reading to a child, special or not, actually we are all special to our Mother, can be very beneficial. You pointed out all the good things that come from reading to your child on a daily basis. I think all children, special or not, will greatly benefit from this. I was lucky to have a Mother who did just that, read to me from an early age. I used to love it and as you said it activated my imagination. Hearing great stories I would use the information for painting or writing music. Later, when I could read myself I would devour books going on glorious trips. When I went to school my vocabulary was big already, well advanced compared to the other children. I grew up without a tv or computer games and am happy about that. I also read your About Us. I can understand you miss your dear sister. She would be happy knowing you have made this website to help other parents with special children. Right, reading everyday especially if started really early, like what your mom did to you, expands the child’s vocabulary and horizon. Especially for children with special needs, even though they may learn slower than normal kids, they still get lots of benefits about learning and of course, more time together develops deep trust with that parent. Yes, this website is dedicated to kids like my sister, who are luckier than she was, being able to attend the Special education programs.